Evansville, IL – Austin Peay State University (APSU)’s volleyball team saw its season-opening win streak end but battled back to claim a split of its two matches at the Dunn Hospitality Invitational, Saturday, at Meeks Fieldhouse. Austin Peay (7-1) battled back from a 2-1 in the day’s first match against Northern Kentucky, but fell in five sets (25-23, 20-25, 21-25, 25-19, 14-16). The Governors recovered in the second match, sweeping host Evansville (25-9, 25-19, 25-23). 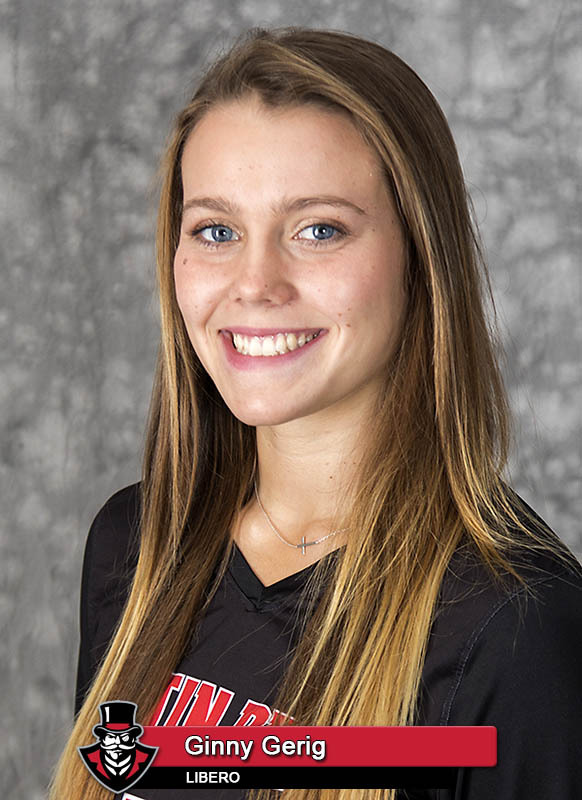 APSU Women’s Volleyball senior Ginny Gerig became the 20th Governors player to reach 1,000 career kills. 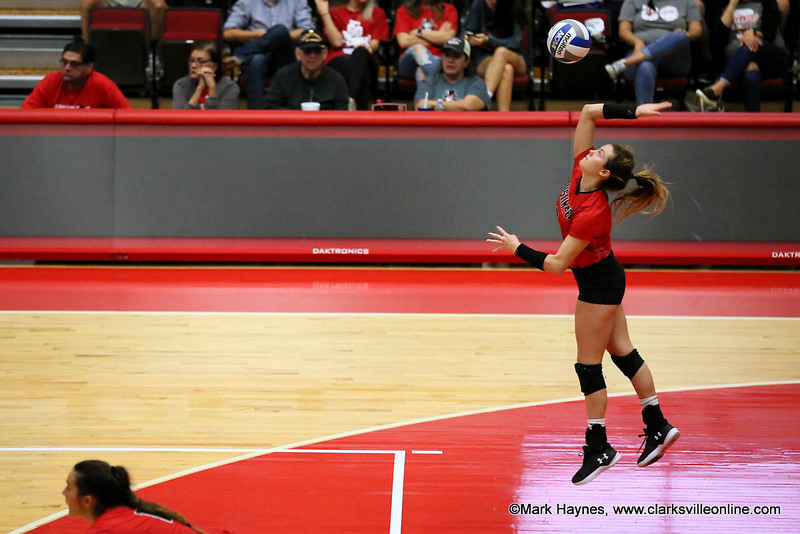 The Govs opened strongly against the Norse, collecting 19 kills in the opening frame en route to a 25-23 victory. However, Northern Kentucky rallied to win the second set in wire-to-wire fashion then held off a late Austin Peay run in the third to take a 2-1 lead. Austin Peay didn’t allow the deficit to effect it, using a 5-0 run early in the fourth set to gain some breathing room and maintained their four-point lead through the set’s remainder to force a fifth set. After the teams traded the opening eight points, Northern Kentucky seemed to take control with three consecutive points for a 6-4 lead. The Governors couldn’t make headway until late in the set, ultimately tying the set at 14-14. But the Norse used a block and a service ace to claim the win. The Governors took out their frustration on host Evansville in the second match. Austin Peay dominated the opening set in wire-to-wire fashion and used a 10-point run to take control. The Purple Aces gathered themselves in time to force back-and-forth action early in the second. However, the Governors again wrested control of the set away with an 8-1 run for a 16-13 lead and they would pull away to win. The third set was the most competitive of the match with 15 ties and six lead changes. Evansville held its last lead at 23-22 after a service ace. Austin Peay got a kill from Caroline Waite to tie the set again and gain serve. One point later, Brooke Moore put down a kill to end the match. In the opener, Cecily Gable poured in an 18-point, 10-dig double-double performance. Moore added a 15-kill, 14-dig double-double and Kaylee Taff chipped in 10 kills and five blocks. In addition, defensive specialist Ginny Gerig posted 21 digs and became the 20th Governors player to reach 1,000 career kills. 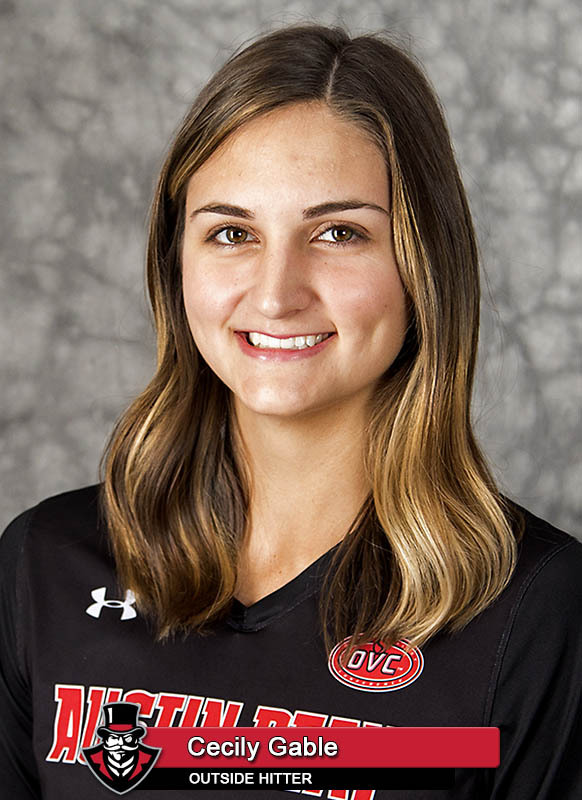 Chloe Stitt was the Govs top performer against Evansville, setting a career-high with 11 kills. The Governors posted 45 kills and a .456 team attack percentage in the sweep. The Governors now return to Clarksville and prepare for their 6:00pm, Tuesday, September 11th home opener against Alabama A&M.